In a nutshell: Yance is no kind of student, but he and his twin brother Hank provide Big Al with a different kind of educational challenge. Biggest secret: He's really smart. He just isn't good at book-learning, unless he can see what it's used for. Favorite Line: "We'll have to dig like anything to make your tiger pit in one day." 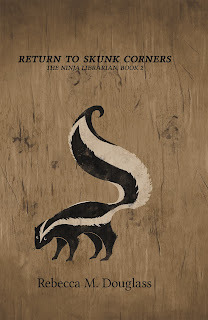 Yance and his twin Hank are in the Skunk Corners school from the beginning, but they move into more important positions in the stories and the town in books 2 and 3. You'll have to read all the way to The Problem With Peggy to learn why they're digging a tiger pit! The series is The Ninja Librarian, with three books, suitable for ages 8 or 9 and up (way up--adults love the books too!). The Ninja Librarian is a humorous set of tall tales set in the highly fictional gold-country town of Skunk Corners. It’s the story of a dusty, tough, unfriendly town that gets a new outlook on life thanks to the advent of the Ninja Librarian—a mild-mannered librarian who offers his wisdom...with a little extra when folks don’t listen. 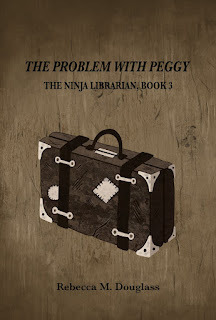 The Ninja Librarian’s back in town, school’s out, and all’s right with the world…or is it? Big Al may be looking forward to spending her time swimming in the creek and wandering the hills, but Peggy’s looking forward to a life of drudgery. If Al can’t find a way to sway her pa, the brightest kid in Skunk Corners is going to take drastic action. With a mystery from the past haunting one of the houses and creating the biggest threat yet to the town, Big Al’s going to be kept busy this summer, and not just with practicing her moves for the Ninja Librarian! Book three sounds the most interesting to me. I like your comment above. It seems the more we think we've developed a world of our own imagination, the more it takes on its own life, with multiple-layers and things we never imagined going on!